HE DEPARTED Dallas well after midnight and made landfall at Philadelphia International around 5 a.m. 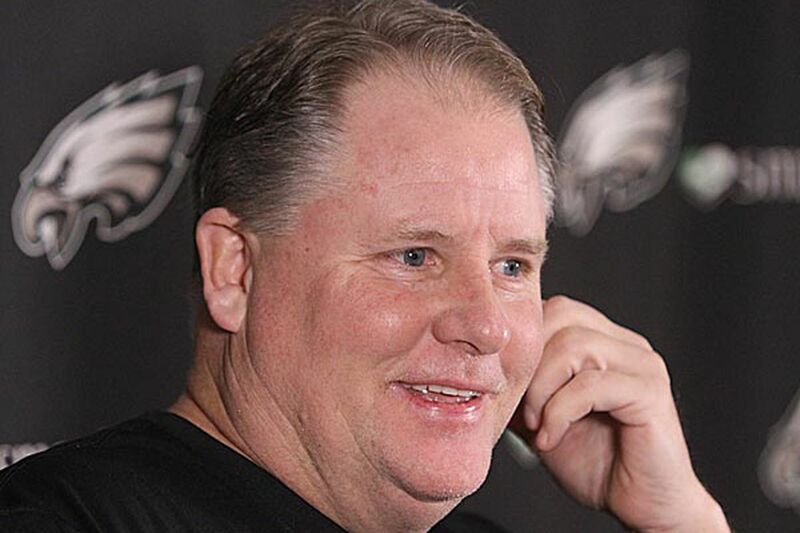 This being Chip Kelly, there were no moments of reflection, or self-congratulation, or sleep. Turns out, the Eagles react to a playoff-clinching win the same way they react to a play from scrimmage. Sprint back to the huddle and prepare to do it again. "It doesn't feel any different," Kelly said yesterday, his heavy eyelids hovering over pupils foggy from the lack of sleep. "That's the good thing about our group and our staff. We've had the same mindset for a long time. It's a weekly basis. Our week doesn't change. The only thing is our week is a day short. Our Tuesday is a Wednesday. That's the only real adjustment we've made. It shouldn't feel any different. It can't be like, oh my God, we're in the playoffs now, we have to do this. That's really not our mindset. We've got a really, really good Saints team, and we've got to prepare the heck out of our guys and get ready to play a game on Saturday night." The preparation began in earnest in the predawn hours yesterday after the Eagles arrived back at the NovaCare Complex, fresh off a 24-22 win that secured them the NFC East title and a home date against the Saints on Saturday. Drew Brees can't make you lose sleep if you have no sleep to lose. He can, however, erode your patience for the little things in life that do not directly contribute to the effort to stop him. Things like a cameraman clicking his shutter in your face at close range from stage left, or a television reporter requesting that you identify specific mistakes committed during your previous game that, if repeated against the Saints, will result in a loss. During his news conference yesterday, Kelly smothered this brand of inanity with the same ruthless efficiency he employs throughout the rest of his professional life, shooing the offending cameraman to a more desirable location and shooting an are-you-friggin'-kidding-me-stare at the aforementioned television reporter before delivering a three-word reply (for the record, Kelly said his team cannot "fumble the ball"). Clearly, stopping a Saints attack spearheaded by Brees and head coach Sean Payton is more complex than avoiding the kind of turnover that put the Cowboys in position for a field goal in the third quarter of Sunday's victory. But Kelly wasn't one to concern himself with your trepidations, even before he earned himself the benefit of the doubt by going 10-6 during his first regular season as an NFL head coach. So if you want the details of his plan, you'll just have to tune in Saturday night like the rest of the nation. Regardless, the Eagles' ability to score points against the Saints will be less about the man calling the plays and more about the ones responsible for executing them. Nick Foles has already answered plenty of questions about his capabilities as an NFL signal-caller, but he also has plenty to prove. He finished the regular season with an NFL-leading 119.2 quarterback rating by taking what the defense gave him - or, perhaps, taking what Kelly's scheme forced the defense to give him - but defenses tend to be less charitable in the postseason, which often requires a quarterback who can create opportunities where there appear to be none. It's why the Bears did not hesitate to go back to Jay Cutler even though Josh McCown's quarterback rating was the third-highest in the NFL behind Foles and Peyton Manning. It's why the 49ers went with Colin Kaepernick last season even after Alex Smith had led them to a 6-2-1 record with a 104.1 quarterback rating that would have ranked third overall. It's why nearly half the players who finished in the Top 10 in quarterback rating at the end of the 2010 season finished 2013 as backups (Michael Vick, Josh Freeman, Matt Cassel, Matt Schaub). The reality of the NFL is such that Foles still has not proved whether he belongs among the perennial MVP candidates whom QB rating smiles upon, or among a capable yet unspectacular realm that has featured players such as McCown and Chad Pennington, who as a rookie starter in 2002 went 8-4 (Foles: 8-2) with a 68.9 completion percentage (Foles: 64.0), 208 yards per game (Foles: 222), 22 touchdowns (Foles: 27) and six interceptions (Foles: two) for a league-leading 104.2 rating. You can expect Rob Ryan and the Saints defense to attempt to force a referendum on Saturday. During the Eagles' win over the Cowboys, there were plenty of occasions when Foles struggled to adapt to adverse situations, occasions that led to five sacks, an intentional grounding call, and the aforementioned fumble. Some of this, Kelly said, was due to his receivers' inability to get open and the Cowboys' ability to generate a pass rush. But there were also occasions when Foles was unable to locate a target who was open. "Sometimes there was a guy open, he probably could have gotten it out of his hand a little quicker," Kelly said. "There were some other times where he's waiting for guys to get open and they didn't come out of the jam." The Saints finished the regular season with the fourth-highest sack percentage in the NFL, hardly a surprise, given Ryan's aggressive reputation. Kelly, of course, has his own reputation, one he managed to burnish during his rookie campaign. Whatever happens, expect the Eagles to conduct their business as they did throughout the regular season: without any pause for reflection.